🌼 WHAT SIMPLE INGREDIENTS ARE REQUIRED? 🌼 HOW TO MAKE THIS MASK? 🌼 HOW OFTEN SHOULD I USE THIS MASK? Being regular with any home remedy is necessary, otherwise you won’t see any good results at all. 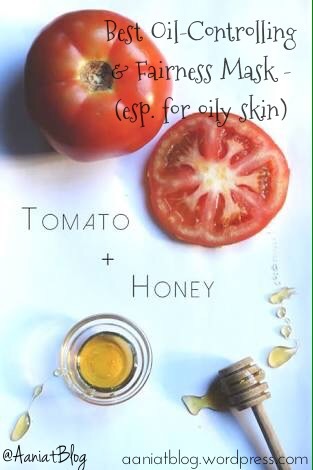 For amazing results, repeat this mask thrice a week. It may be tempting to wash your face often to reduce the shine that comes with oily skin. However, over-washing your skin is one of the worst things you can do to your acne-prone skin because over-washing can cause dryness and irritation, resulting in more acne. Just wash your face twice a day properly. Avoid heavy makeup (greasy & oily foundations & concealers) as it can clog your pores and also make your skin more oily. How to make tomato juice? Should we blend the tomatoes in the blender or just squeeze them? Blend it in the blender. p.s : your BLOG is amazing.